Well, my fear of a seven part serial came true. This was too long, with the Silurians not even really being encountered until the end of the third episode. It’s possible if I didn’t know who the Silurians were and hadn’t seen “The Hungry Earth/Cold Blood” which hit a lot of the same story beats as this seven-parter than I might have been more forgiving of the pacing issues here. Maybe. That said there is a lot to like about this story. It is a darker tale with an ending that I did not see coming. I’ll get back to that. The Doctor’s relationship with UNIT at this particular junction is interesting. He is rather dependent on them, since he can’t just jaunt off in his TARDIS. He can only gain access to places like the nuclear research facility because of the Brigadier. At the same time, he takes umbrage at being at the Brig’s beck and call. The Doctor and the Brigadier also have opposing world views that cause friction here. The Doctor wants to find a way to make peace with the Silurians and find a way for the two races to co-exist. The Brigadier sees the Silurians as a potential threat and he isn’t wrong. They aren’t exactly pursuing an agenda for peace at the start of the story. They kill off the leader who wants peace pretty quickly and then set out trying to wipe us damn dirty apes off the face of the planet. One thing I do like about the Silurians is that they do have a legitimate claim to the planet. They existed on it before humans evolved and their shock at learning a new species is now running things is genuine. It makes for a nice change of pace from aliens who want to conquer the Earth for whatever random reason. The Silurians don’t see themselves as conquerors. They believe they are simply taking back what is theirs. Unfortunately, because it does take so long for the Silurians to really make their presence known the more intriguing aspects of the story are rushed. The Doctor is able to convince the leader to try and make peace with the humans really quickly and then the leader is just as quickly killed off by the Silurians who want war. I like the yellow roadster the Doctor uses here. If he can’t have the TARDIS he should have a cool vehicle to drive around. The license plate is a nice nod to the fans. Liz continues to impress here. She stands up against the sexism directed her way by the men surrounding her even if she doesn’t always get her way. Honestly, what galled me was when the Doctor and Liz are trying to find a cure for the deadly bacteria and the Brig pulls her away to answer phones. Speaking of, the bacteria added some nice tension to the later episodes, especially as Masters unwittingly spreads it throughout London and people start dying off. That threat shows off the Doctor’s scientific genius quite well. Captain Hawkins was quite fetching. Too bad he doesn’t survive the story. I was not expecting that ending. The main threat is ended and the Silurians are put back to sleep. The Doctor is pleased because he can revive them in later years and hopefully learn from them and make peace between the races. The government has different ideas, and has the Brigadier bomb the caves and bury the Silurians. The happy ending with the Doctor tinkering with Bessie turns rather dark as he and Liz witness the bombing from afar, and the Doctor views it as murder. I had assumed that the Silurians would just be allowed to be put back to sleep and that would be it. All in all, a fine story that is too long but makes up for that with some interesting plot twists and a rather grim ending. Interesting to see the perspective of someone whose first exposure to the Silurians was "The Hungry Earth"/"Cold Blood." The thing is, part of what made the Doctor's quest for a peaceful resolution so urgent there was the fact that he'd failed in his past attempts to make peace between humans and Homo reptilia, that he felt he'd let the Silurians down in his prior lives. That's the inspired thing about Malcolm Hulke's concept here, as absurd as the science was. The Doctor is a champion of the people of the Earth, but as an outsider, he can recognize that the Silurians have as much of a legitimate claim to that title as the humans. So it's not like the usual plot where he's defending against invaders and one side is clearly in the wrong. He wants to do what's best for both sides, but the warmongers and bigots on both sides won't let him. It's interesting that they chose to deconstruct the "alien invasion" trope that way practically at the start of the Pertwee era, given that it was largely defined by defending Earth from alien invaders. I didn't remember a lot of details about "The Hungry Earth/Cold Blood" but I did remember the broad strokes and watching "The Silurians" I could instantly tell how much that two-parter borrowed from this earlier story. 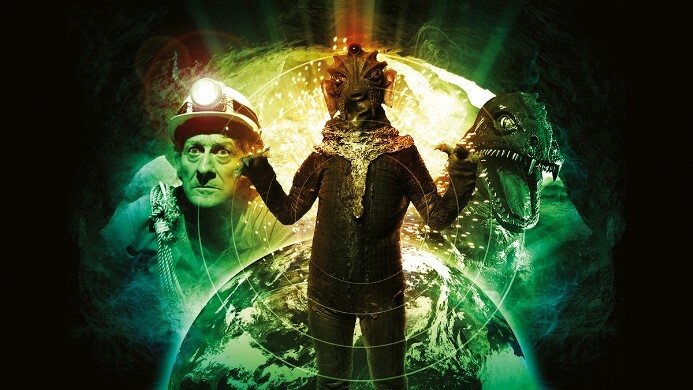 I do think had I seen "The Silurians" first it might have interested me more but since I knew the main story beats that were being hit I found some of it dull. This was a good way to subvert the alien invasion trope. In this case, humanity was seen as the invaders. I think the other two serials in Pertwee's first story, "Ambassadors of Death" and "Inferno" also did a good job of staying away from alien invasion story lines. "Ambassadors" looked to be an alien invasion story but instead the aliens were victims of a general who was using them to sway public opinion against aliens. "Inferno" was an alternate Earth story line with a fascist regime in charge of England with the main threat coming from slime buried in the Earth's core that turns people into heat werewolves, essentially. There's also a mad scientist too. The only true alien invasion was in "Spearhead from Space."